Sick of picking half eaten tomatoes? Blueberry bushes with no berries? How about finding your leafy greens without leaves, or finding your neighbour’s pet has been through your new garden bed? As most keen gardeners know there are very few simple and inexpensive methods to protect their precious plants from pests without using chemical sprays or elaborate systems. One can quickly become frustrated at the lack of an easy solution to one of the main problems that every gardener faces… until now! Affordable and easy to use Popadome is an environmentally friendly solution to garden pest control that eliminates an endless variety of unwanted animals and insects. Designed to be the perfect solution to pest problems, Popadome protects everything from garden beds, fruit trees, berry bushes and flowers to newly seeded lawns and even sandpits, keeping out birds, butterflies, caterpillars, slugs, snails, insects, cats, dogs, possums, rabbits and even livestock! All without the use of sprays, pellets or potions. Based on a tried and tested dome tent platform the Popadome is simple to use and can be assembled and erected in under 10 minutes. 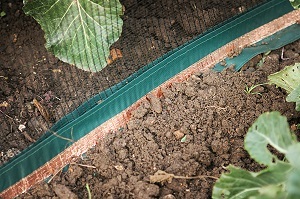 Simply slide the two poles through the robust sleeves, place over your plant or plants and peg down. When you’re finished just pack it away in its carry pack or use in a different location. The UV stable netting gives you years of life in harsh conditions whether it be under the hot summer sun or through cold and wet winter days. 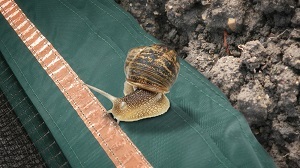 The unique sewn copper strip around the base will deter snails and slugs the natural way, and the full-length integrated zip allows easy access to your crop. 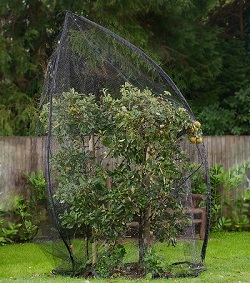 The green structure and black netting will blend seamlessly into your garden environment and allow you (and your jealous neighbour) to see the fruits of your labour. Popadomes are currently available in three standard sizes: 0.9m x 1.8m, 1.2m x 1.2m and 2m x 2m, with additional accessories to transform your classic Popadome into a mini greenhouse, frost cover or fine mesh insect barrier. All accessories are customised to fit directly to your existing Popadome and include zips that match your Popadome’s zip so you can always get to your plants easily. Get a Popadome for your plants today – before something else eats them!